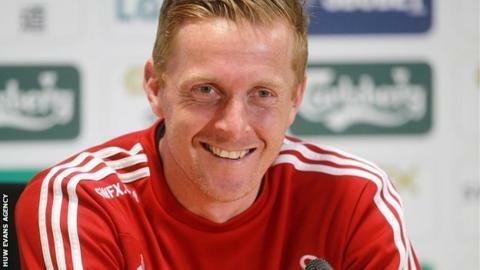 Swansea City head coach Garry Monk has had preliminary talks with chairman Huw Jenkins over his future at the club. Monk took over on a temporary basis from sacked Michael Laudrup on 4 February and has guided the Swans to Premier League safety. Asked if a recent conversation with Jenkins amounted to a job interview, Monk replied: "Yeah, I think probably - probably part of it." Monk's future is expected to be decided before the end of the season. Since taking over, Monk has seen his side win four, draw three and lose five of their Premier League games. Swansea secured a place in the Premier League next season when they beat Aston Villa 4-1 at the Liberty Stadium. Monk says Jenkins wanted to hear his thoughts on the club's future on behalf of the club's board. "[And] quite rightly so, they're protecting the club," said Monk. "Okay, I've been here for 10 years. They know that I'm never going to do anything detrimental to the club. "But they've got the right to understand what anyone that works for this club [thinks], what their views are on it and what their views going forward are. "So it's pretty much what I expected, to have that conversation with him." Monk says the conversation with Jenkins also looked at Monk's actions since taking control of the team. "It was more of a review of what I've done in this season and going forward how I feel about things, what I would do and all this sort of stuff; generally like you would do. "You would have that chat and I think the chairman took it on board." Monk joined Swansea as a player in 2004 when they were in League Two under former boss Kenny Jackett and became captain two years later.